I forgot this one on my other post. Excellent!! Great capture, light and situation!! Nicely done Robert. How old is King now? Thanks...He's now four, he'll be five on August 5th. Still very much the puppy at times. He's been with me since he was eight weeks old, and I could hold him in one hand. 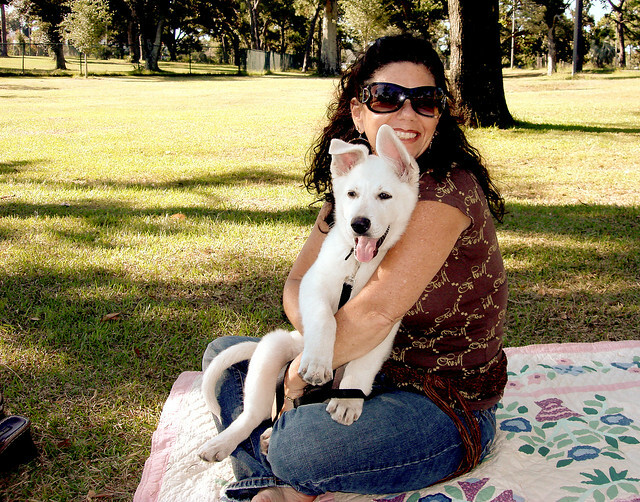 Here he is, at nine weeks, with my friend MaryAnn at Bayview Park in October 2007. Thanks, Maryintexas39, I appreciate the comment! I lived about half my life between Wichita Falls and Tyler, before moving to Florida. I miss East Texas often. funny, my mom is an east texas gal. hemphill. around the jasper area. beautiful there. i'm on the gulf coast, houston, clear lake area. I'm on the Gulf Coast as well. Love it here. No ice, snow, or even sleet. Mild winter, but horrible humidity. King was a great looking pup.